What do you get for the man who has everything this Christmas? Well does he have a Terminator? No, we didn't ask if he had HD DVD. Does he have a Terminator? Yeah, that's what we thought. Well, if you're sincere about getting the man who "has everything" something he doesn't have, then maybe you should pick this one up. From Terminator 2, this chrome-plated T-800 endoskeleton can be yours if you win an auction going on today and tomorrow at the Profiles in History auction house in Calabasas, California. While chrome is nowhere near as advanced a technology as the T1000's liquid metal, this endoskeleton is still expected to fetch somewhere near $100.000—probably because it was featured in the opening credits of Terminator 2. 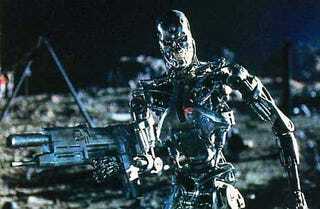 If you prefer your Terminators with flesh, a skinned model from Terminator 3 will also be up for auction. It's expected to bring in slightly less money, somewhere between $60,000 and $80,000.